Composition:Propylene Glycol, Sorbitol, Sugar cane molasses, sodium salt of organic acids (sodium benzoate). Additives (per litre):- Aromatic 2b Substances: mint (Mentha piperata - HE) 10,000 mg, apple flavor 5100 mg. - 3a-Vitamins, pro-vitamins and substances with similar effects: E672 Vitamin A 7,000,000 IU; E671 Vitamin D3 400,000 IU; 3a890 choline 7745 mg; 3a315 vitamin B3 11,000 mg; 3a700 vitamin E 10,000 mg; pantothenic acid (vitamin B5) 5,500 mg; vitamin B2 4500 mg; vitamin B1 3500 mg; E300 vitamin C 2,200 mg; 3a831 vitamin B6 1,100 mg; vitamin B12 11 mg.
Daily allowance:Put a full syringe into the foal’s mouth from birth. Give 3 syringes the first week (D1, D3 and D7). If required, give one syringe per week during 2 months. 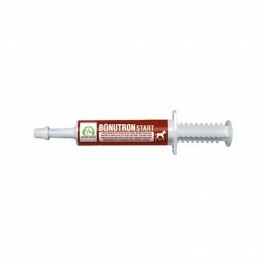 For reluctant foals, Bonutron Start, thanks to its gel texture, can be applied to the mare’s teats.